macXvideo 1.5 無料ダウンロード - Cut, trim, crop, add effect to 4K video.Compress video and export to MP4, H265. macXvideo is the first free video processing tool especially designed for 4K, 5K and 8K Ultra HD videos. It provides the easiest, most stable and reliable way to edit, compress, transcode, create and share 4K videos. With a bunch of professional features that are on par with a pro editor built in the most intuitive interface, everyone can make amazing movies in no time! The unique 4K engine promises the fastest speed, best output quality and lowest bit rates, an essential video helper for all 4K & HD video buffs. 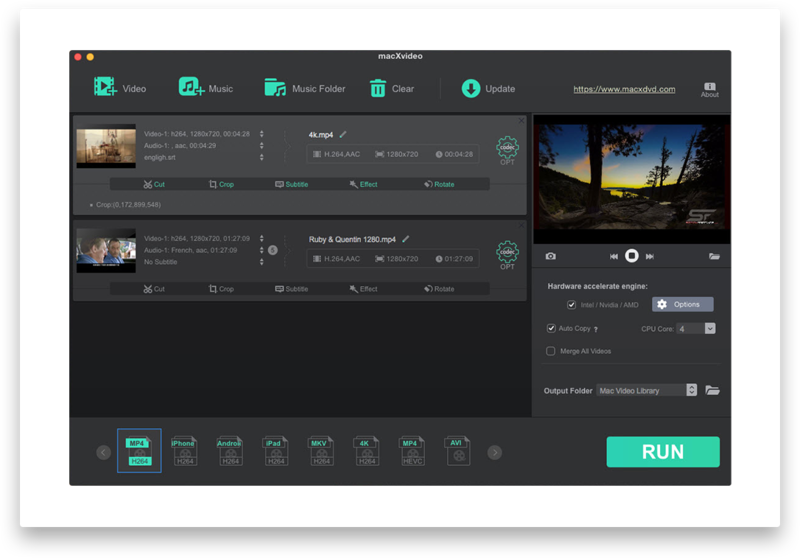 With support for 370+ video/audio codecs, it accepts any video, including 4K HEVC, ProRes, XAVC, AVC, HD, SD videos from DSLR, GoPro, camcorders, drones, mobiles, etc. Flexible editing options are at your fingertips to trim, merge, rotate, cut, split, control video/audio speed, adjust audio volume, adjust display etc. The large effects library will give even the most amateur videos a professional look, including grayscale, vigentte, mirror, noise, negate etc. A compress engine purpose-built for 4K videos makes it the only free video editor that offers the minimum output size with highest quality. Specifically, it's able to reduce the size of 4K/HD videos by 90% with 98% original quality. There is an easy export to popular formats like MP4, HEVC, H.265, H.264, MOV, AVI, and MKV. It even converts music/music folder to MP3. In just 1 click, videos can be perfectly prepared for YouTube, FB, Twitter, Instagram, iPhone, iPad, Android etc. macXvideo offers serious advantages when it comes to 4K processing speed. It's the only freeware that applies all the major hardware acceleration solutions Intel QSV, Nvidia Cuda/Nvenc, AMD in the whole 4K processing. The HW speeds up 4K processing by 5x faster than its closest competition, and solves the overheating or freezing problem when users edit or process UHD videos. The free video editor is also surprisingly easy to use. With all features conveniently placed, even the most novice user can start editing immediately.